Yesterday was another day of price action with a further attempt to rally promptly capped by the 9 day moving average and with the close of the trading session ending marginally below the 40 day moving average. As outlined in several previous market commentaries the outlook for the euro vs dollar is now looking increasingly bearish and the last 6 days of sideways price action with attempts to rise having been capped, adding further weight to this analysis as each day has passed. All we have been waiting for is a break of the 40 day moving average which duly arrived in this morning’s London forex trading session and is now signalling a deeper move as a result as we clear this key technical indicator. As suggested in yesterday’s market commentary a breach of this indicator should see the bearish move gather pace and this has been clearly evidenced in this morning’s trading with the euro vs dollar breaking fast and moving below USD1.27 as a result. 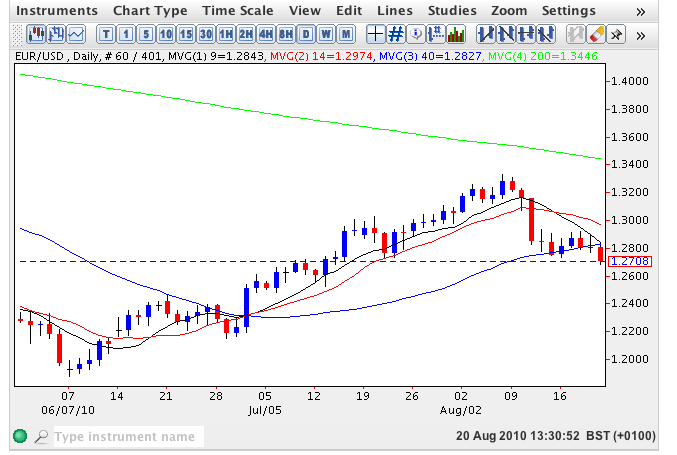 The bearish sentiment is further enhanced with the 9 day moving average now crossing the 40 day giving us a bear cross signal and provided this price action continues in the US trading session and we duly close on a wide spread down bar then the bearish trend will be re-established and we can expect to see a deep and significant move, initially to re-test USD1.2397, followed by USD1.2151, down to USD1.1876 in due course. With no fundamental news items today the euro vs dollar may take its lead from the broader market which continues to worry about the extent of any global recovery. This pessimistic mood would tend to favour the US dollar over riskier assets.